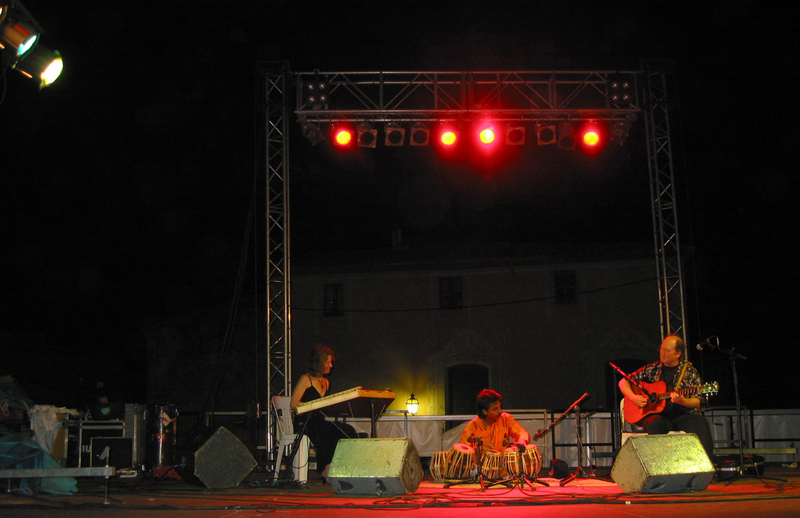 Concert in Tarragona Provence, Spain, August, 2005. Hi-Res Trio Photo (2.5" x 1.6" 600 dpi jpeg, 500 k) by Kantoya Producciones. 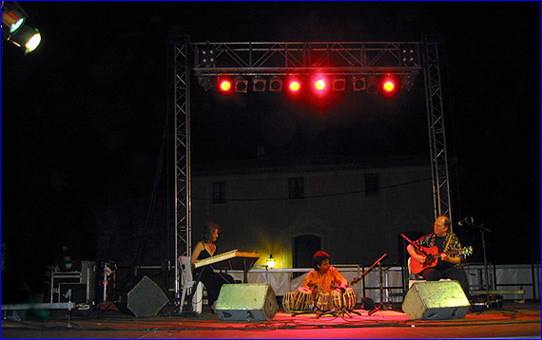 Shown: Mariah Parker (santur), Tappan Bhattancharya (tabla), Matthew Montfort (scalloped fretboard guitar). Ancient Future is the first and longest running musical organization dedicated in exclusively to the mission of creating world fusion music, fusing elements from music from all around the globe. There are more than 12 versions from the band, each with different musicians from different cultures in order to fully explore the varieties of world fusion music. This version of the band Ancient Future concentrates on Spanish and Arabic musical themes with Indian tabla accompaniment. They have performed in Spain at international guitar festivals in Sant Carles de la Ràpita, Botarell, Torredembarra, and Salou. The ensemble is available for performances in Europe with reduced travel costs because some of the musicians reside there most of the year. A Mythical History of Love and Passion for the Music of the World. An Interview with Matthew Montfort. By Sergio Vilar. Published in 2003, by Nucleus, Argentina. >YTmusic (repertoire). Studio recordings of sample repertoire that is played by this band variation of Ancient Future. El Zaffa (Montfort. 4:26) iTunes. >YTmusic. Original composition based on the Egyptian wedding procession rhythm (elzaffa). From Planet Passion. (Ancient-Future.Com AF-2001) CD/Gift Card, $17.98: Add 1 to Cart. Buy 1 Now. I Mett Her in the Medowe (Traditional. New arrangement/composition by Matthew Montfort. 4:12). iTunes. >YTmusic. From Planet Passion. (Ancient-Future.Com AF-2001) CD/Gift Card, $17.98: Add 1 to Cart. Buy 1 Now. 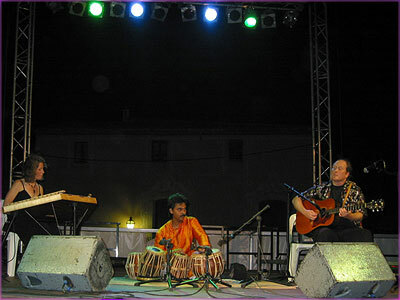 Mariah Parker (santur), Tappan Bhattancharya (tabla), Matthew Montfort (scalloped fretboard guitar). Tapan Bhattacharya (tabla) hails as one of the leading artists in his field, with a brilliant professional background with more than 15 years of experience. Tapan has performed in the most prestigious theaters, rooms and festivals. He was born in the sacred city of Benares (at the Ganga river side in India), where he studied under the brilliant guidance of one of the most prestigious tabla masters of his country, his Guru Pandit Kavriaj Ashutosh Bhattacharya. Tappan is known for combining a deep technical knowledge with an irresistible creative vitality and playfulness that is transmitted through his tabla performances.